Being more sensitive to salt stress among the cereals, growth of rice (Oryza sativa L.) has been habitually affected by salinity. Although, several practices have evolved to sustain the growth of rice under salinity, the enormous role of calcium (Ca2+) as a signalling molecule in salt stress mitigation is still arcane. Considering this fact, an experiment was performed aiming to explicate the mechanism of salt-induced growth inhibition in rice and its alleviation by exogenous Ca2+. At germination stage, 10 mM and 15 mM CaCl2 primed rice (cv. Binadhan-10 & Binadhan-7) seeds were grown in petri dishes for 9 days under 100 mM NaCl stress. At seedling stage, 9-day-old rice seedlings grown on sand were exposed to 100 mM NaCl alone and combined with 10 mM and 15 mM CaCl2 for 15 days. This research revealed that salinity radically slowed down growth of rice seedlings and Ca2+ treatment noticeably improved growth performances. At germination stage, 10 mM CaCl2 treatment significantly increased the final germination percentage, germination rate index (in Binadhan-7), shoot, root length (89.20, 67.58% in Bindhan-10 & 84.72, 31.15% in Bindhan-7) and biomass production under salinity. Similarly, at seedling stage, 10 mM CaCl2 supplementation in salt-stressed plants enhanced shoot length (42.17, 28.76%) and shoot dry weight (339.52, 396.20%) significantly in Binadhan-10 & Binadhan-7, respectively, but enhanced root dry weight (36.76%) only in Binadhan-10. 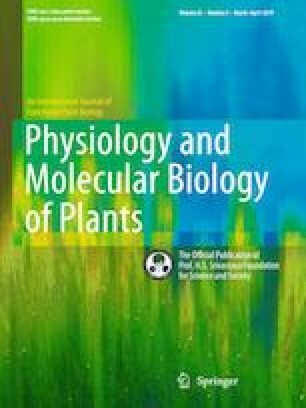 In addition, 10 mM CaCl2 supplementation on salt-stressed seedlings increased the chlorophyll and proline content, and oppressed the accretion of reactive oxygen species thus protecting from oxidative damage more pronouncedly in Binadhan-10 than Binadhan-7 as reflected by the elevated levels of catalase and ascorbate peroxidase activity. The 15 mM CaCl2 somehow also enhanced some growth parameters but overall was less effective than 10 mM CaCl2 to alleviate salt stress, and sometimes showed negative effect. Therefore, supplementary application of calcium-rich fertilizers in saline prone soils can be an effective approach to acclimatize salt stress and cultivate rice successfully. The authors are also grateful to Promod Kumar Nagar for his valuable suggestions in manuscript preparation.